360 Security Antivirus: Find My Phone Settings & Deactivation Process. In my previous post, I explained that how to activate 360 Security app Find My Phone (Mobile tracker) Feature. As we know that 360 Security has a good mobile tracking function name Find My Phone. After activation of 360 security finds my phone feature, you will need to set up the options, without settings you can’t properly use this feature. Also sometimes need to deactivate the Find My Phone. So In this post, I’ll tell you about Find My Phone settings & deactivation. Open 360 security application & Tap on top left 3 line menu. You’ll see 360 security main menu, In this menu tap on Find My Phone Option. If your smartphone Find My Phone feature is activated, you’ll see a Find My Phone’s main features. If Find My feature is not activated on your smartphone, then activate it first. To activate 360 Security Find My Phone feature read this post- How to activate 360 Security-Find-My-Phone-feature? Tap on top right corner gear icon of the Find My Phone window. Now it will ask you to enter Gmail address with which you have activated the Find My Phone feature. Enter Gmail Id & tap on OK. 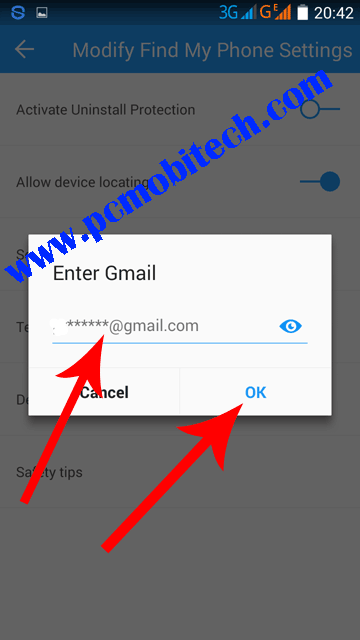 If you have entered correct Gmail email id then you will see Modify Find My Phone Settings screen. 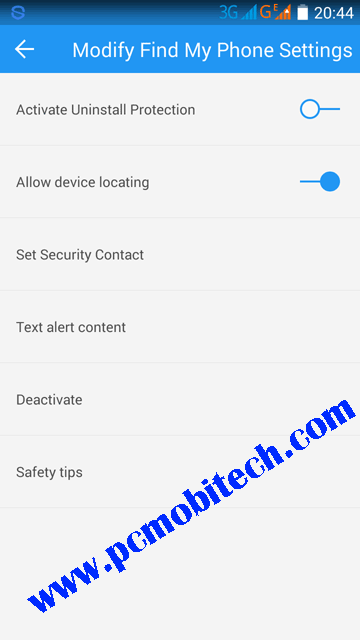 In Modify Find My Phone settings 6 option available- Activate Uninstall Protection, Allow device location, Set Security Contact, Text Alert content, Deactivate, Safety tips. 1. 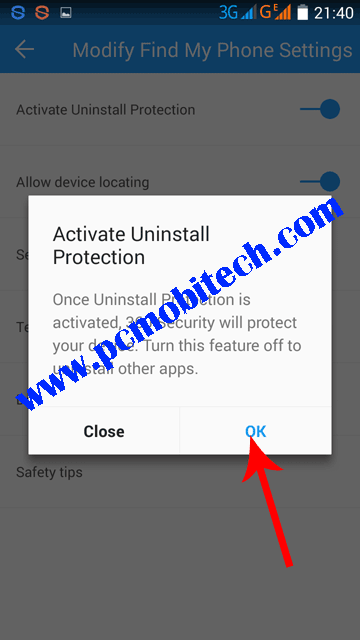 Activate Uninstall Protection- With this feature you can activate apps uninstall protection. If this option would be turned on. No one would do 360 Security antivirus disable and uninstall any app. It is a more powerful security feature. If you want more protection, so it is necessary to activate it first. To activate uninstall protection tap on slider icon in the right of Activate Uninstall Protection. Now it will ask you to verify your decision, to verify tap on OK. When you tap on OK then you will need to giving full power to the 360 security app, then it will be able to protect your device. To give full power, it would make the device administrator. To make the device administrator screen will appear, when the screen appears, click on the Activate button. After activation, you’ll see confirmation message then tap on Got it. Note: When you want to disable Uninstall protection follow same steps as above & tap on slider icon again to disable Uninstall protection. If you want to disable device administrator power then Go to smartphone settings>>Security>> Device Administrator>> Untick 360 Security check box. 2. Allow device locating- If this feature on, so you can view your device’s location online. To enable device location tap on Allow device location option toggle button in Modify Find My Phone Settings. Now it’ll ask you to enable device location then tap on Enable. Now you will see device Location setting, tap on top slider button. After this, you will see a verification popup screen, tap on Agree to verify. Note: This is a battery hungry feature, it drains your battery faster. But you can easily disable your device location at any time later – Go to smartphone settings>> Location. 3. Set Security Contact- This feature is most important. If someone has stolen your smartphone. If that person will change your smartphone’s SIM. Then the SIM change the message you will receive on the registered mobile phone number. Therefore it is urgent that a security mobile number must be set. 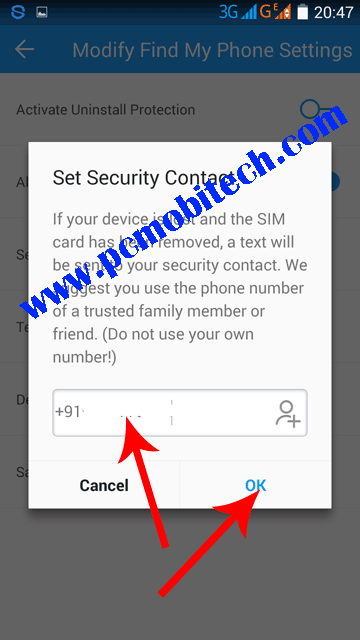 To setup, Security contact number tap on Set Security contact option in Modify Find My Phone Settings. Now enter a mobile number with country code. +911234567890 or +11236547890. you can also select the contact from your contact book by tapping on Ω+ icon. After entering mobile number tap on OK.
4. Text alert content- In the Text alert content, you can fill an alert message. When someone will change the SIM then this message will come on your registered mobile number. 5. Deactivate- Sometimes you want to change the SIM yourself. As soon as you change your smartphone’s SIM. The message will be sent by 360 Security through your new sim on your registered SIM automatically & this process continues until the full balance is not over. So whenever you want to change your smartphone’s SIM. Then first deactivate 360 Security Antivirus Find My Phone feature. Otherwise, your Sim will be continued sent messages and your balance will be deducted. 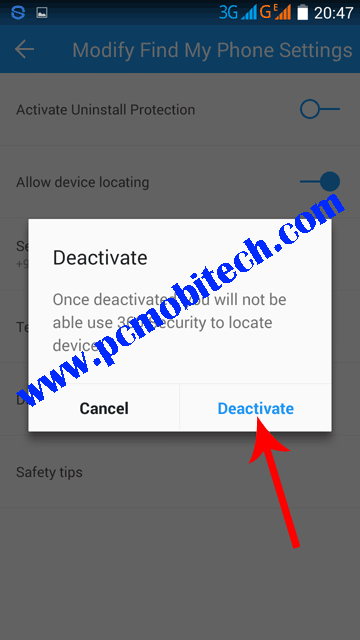 To Deactivate 360 security Find My Phone Feature tap on Deactivate option in Modify Find My Phone Settings. A popup screen will appear then tap on Deactivate. Track, lock and erase data (Android smartphone) using Google Account. How to track lost phone with 360 Security. How to block calls on Android using 360 security antivirus. 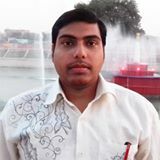 Any problem & suggestion please share with us. could you please explain a feature of 360 Security APK v8.4.88.150 Premium. mode selection. 3 options or choices.intelligent mode,eye protection mode ,power saving mode. I have selected battery saving mode as i do not understand the two other choices and their benefits. Ihope you have time to helpme.Regardless,i wish you much happiness and success in our troubled world. Herb,from Bucca Australia,,,,,a very tiny place in outback Australia. Good on ya mate. 360 Security APK v8.4.88.150? What version about your are talking? Will you please leave a link for the app, so I will check the features.